Inspired Audio and LMC Audio Systems Ltd have announced their agreement to develop the UK and Ireland loudspeaker market together. Following extensive research and collaborative testing, Inspired Audio and LMC Audio Systems Ltd have signed an agreement for LMC Audio to sell and service Inspired Audio products in the UK and Ireland live audio market. Inspired Audio has developed a premium quality loudspeaker system family designed, manufactured, and tested in Nottingham, England, by the team lead by design director Chris Scott, who has a track record of over 20 years of original design success. 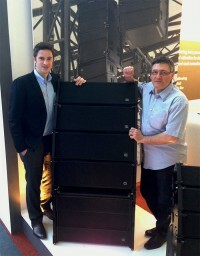 With an attention to detail, and an awareness of market requirements for precision-engineered line-array and point source boxes, Scott is utilising cutting-edge components and design techniques to create a new generation of expressive and daring loudspeaker products, which are, as Scott describes them, 'as close to plug and play as the laws of physics allow'. The Inspired Audio product range delivers hugely common-sense integrated system solutions; premium quality loudspeakers and amplifiers that integrate together seamlessly to deliver consistently impeccable sound quality across all applications. Scott comments: "Inspired Audio gives me a clean sheet of paper in terms of the product and, equally importantly, how that product was represented in the marketplace. It is fair to say that having been around the block a few times I had clear ideas on what does and doesn’t work and I knew that I wanted a clear, simple and controlled route to market, making a well-placed distributor the obvious choice for the UK. LMC Audio demonstrate they understand the marketplace, they know and connect with the players from big to small and are endowed with a wealth of competent, energetic talent throughout the company. My relationship with LMC Audio goes back a long way and resulted in an initial meet up at the Frankfurt show last year, cooperation at the PLASA show and now the combining of our strengths to deliver to the UK market, so we haven’t had to rush at it in any way. Life is about timing and, in this case, I am delighted that the timing was right for both parties and most importantly the market too. Exciting times, inspired times!" LMC Audio’s managing director, Paul Hinkly, comments: "We are delighted to be partnering Chris Scott and his team in the UK to bring the Inspired Audio loudspeaker product range and ideas to the market; products including the family of premium quality Optima line-array systems. Many industry watchers will note that it is long overdue that LMC Audio should be going outside the mainstream market and introducing a new UK market challenger to the premium quality users currently so dominated by just a couple of brands in the UK. We are very excited to be doing so now, and can't wait to begin the hard miles of bringing the easy, efficient, flexible systems to the users and applications. I say this to engineers and PA companies operating across all markets: Unlike rivals that require eye watering investment, Inspired Audio's aim is the delivery to you of realistic and sustainable audio and commercial returns, and is supported by both manufacturer and LMC Audio on an hour by hour basis. If you want your own work to turn listening heads in the search of growth and new revenues, then contact LMC to arrange a listen. You will be going outside the mainstream, and LMC are going with you." Hinkly adds: "We will be launching the Inspired Audio range of products at the PLASA Focus show and all are welcome to join us there for an introduction and demonstration session, 5.30pm - 7pm, on day one of the show, Tuesday April 30, in the News Room at the Royal Armouries Museum. Come and pick up your invite from our stand, N-C28, at the show and we’ll see you there for a real listen. And the Competition? Come and have a listen! All are very welcome." In picture: Will Hinkly, technical sales at LMC Audio and Chris Scott, design director at Inspired Audio with the Optima 8 line array system, exhibited at the Prolight and Sound 2013 show in Frankfurt.